Multispec LP | Hawk Research Laboratories, LLC. 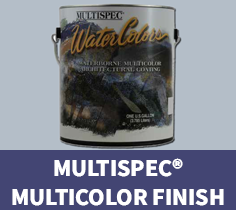 Multispec multi-color finish is available in a wide range of colors and possesses excellent durability. The Multispec finish is fully compatible with all Hawk clear topcoats and primers, and can be used on countertops, walls and a variety of hard surfaces. For a more dramatic look, combine the Multispec finish with our Dynamic Fleck Enhancer or Dream Metallics Collection.